STRABO: DECLARATIONS OF ERATOSTHENES: Factual or misquoted, an investigation. 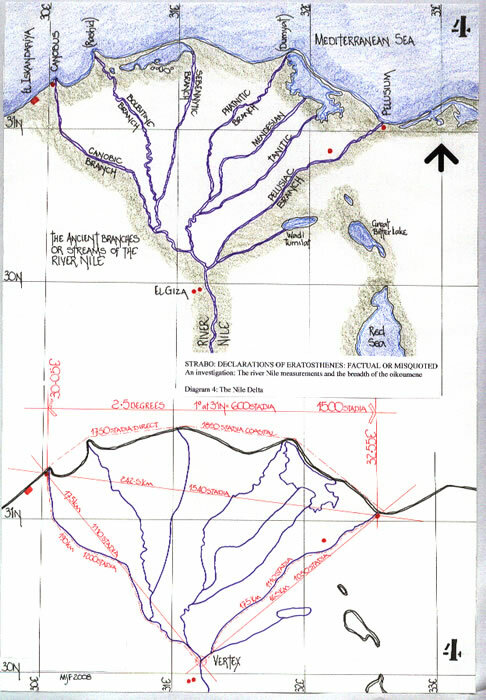 The River Nile measurements and the Oikoumene. Within Strabo’s ‘Geography’, Book17, chapters 1-4, there is an attempt to portray the river Nile both descriptively and by distance measure, from Meroë to the Aegyptian Sea. This is preceded by the words; ‘And here too I must first set forth the declarations of Eratosthenes’. It is obvious, when reading the text, that in fact they have not been set forth, (as we may expect today), but paraphrased and perhaps misinterpreted. An analysis of the text and measurements enables us to reconstruct the original, cast light upon Eratosthenes’ world measurement and conclude the argument apropos the length of the stadion within the texts of Eratosthenes’ and Hipparchus, as quoted by Strabo. The text of Strabo1 (c66BCE – AD21) supposedly contains a record of the text of Eratosthenes2(c275-194BCE), but, as they are some 200 years apart, perhaps that text was subject to the vagaries of miscopying in the intervening period. We know that Eratosthenes followed both Zenodotus and Apollonius of Rhodes as Librarian of the Great Library at Alexandria. It was founded by Ptolemy II (309-246BC), around the beginning of the Third century BCE. Thus, with only 75 years of Greek influence upon the writings of Aegypt (spelling as per translation), at the time of Eratosthenes, we can assume Aegyptian measures were still paramount, and, in those first years the majority of texts collected included many from the great Temples of Aegypt. When Aegypt became a Macedonian Greek Kingdom by the partitioning of the empire of Alexander the Great following his demise, it would have been impractical for Greek measure to have been imposed upon the populace, let alone change the thoughts and actions of the priests of the great temples. Therefore, we may infer that any measurements would have been founded in the Aegyptian system3 and comprised of their standards3, the Amma, Cubit, Derah, Kassaba, Remen, Theb, Terto, and ITRW or ITERU. The ITRW or ITERU is a measure of 20,000 Royal Cubits, and a Royal Cubit has been assessed by archaeologists as 525mm in length. These measurements would, of necessity, and when convenient, have been translated into Greek equivalents, but would have been strictly Aegyptian measures3. In Aegypt before Eratosthenes’ era, the world had already been determined in size and shape4. The passage of the Sun across the heavens and through the underworld was assessed as 3708 ITRW, which comprises the twelve sections of the DUAT, and is a metrological calculation thus; 12 x 309 ITRW = 3708; to which must be added the width of Aegypt, 106 ITRW, thus providing us with a total measurement of 3814 ITRW or ITERU.. Therefore we may calculate the Aegyptian world as, 3814 x 20,000 x 525mm = 40,047Km. It is also possible to conclude that this information was part of the historical data which may well have been transmitted to the Great Library of Alexandria and available for use by Eratosthenes. The geographical world is normally expressed as; Equatorial circle = 40,077 Km and the Meridional circle = 40,009 Km, which is the comparative measure used. The questions we must ask and resolve are, 1), ‘did Eratosthenes visit Syene and Meroë to measure the Nile or at least gain knowledge of the river?’ If not, 2) ‘did he use translated Aegyptian texts to write his geographical notes about the river Nile?’ and, 3)’ did the data from the river Nile measures provide the base measure for the Syene/Alexandrian solstitial phenomenon to be used later for the calculation of the Earth’s circle?’ The solstitial calculation is fully explained, including the world measure calculation, in 2.5.7. Strabo clearly states in 2.5.12 that; ‘At any rate, when (Aelius) Gallus was prefect of Aegypt, I accompanied him and ascended the Nile as far as Syene and the frontiers of Aethiopia’. Therefore it is incumbent upon us to reflect upon those words as we read the text of Strabo and his description of the river Nile. Having established the parameters of the research we may now analyse the text written by Strabo, ‘The Geography’, Book 17, chapters 1-10 and similar chapters, which equally apply, from Books 1 and 2. As a geographer, we can expect Eratosthenes to have been a little more precise. Just where is the Nile, 900/1000 stadia distant? He has a large choice: from the Khalia es Suweis to the Red Sea at Djibouti. In fact there is only one position the measure is vaguely correct, from Qena north of Luxor, to Bur Safajah on the Red Sea. The basic distance is actually c225 Km or 1425 stadia of 157.5m. With the classical Greek alphabet Eratosthenes was somewhat handicapped in his choice of metaphors. One must wonder if he would have used the English ‘S’ instead. We now arrive at an enigma- what is MEROË- is it an island, a kingdom or a city, all of which are used later in the text as descriptions? Here it is left unidentified by Strabo and thus indicates Eratosthenes’ text is paraphrased, and, from this text we cannot just assume a singular place for Meroë. But, the bend which forms the winter sunset line is known. And, as confirmation of the new direction, the winter sunset is reasonably described at a bearing of 242 degrees between latitudes 15N and 30N.This accords with the route of the geographical Nile. However, here we also glean our first idea of Strabo’s descriptive prose; ‘towards the north’ and ’towards the south and the winter sunset’ (i.e. 2420), is in fact only a 28 degree turn from the original north bearing at the bend. Thus when we read towards the north, south or similar directions we should not consider a geographical point as Strabo’s descriptive prose is too vague. The actual river Nile flows some 10 degrees west of north before turning to the north east and the second cataract. The information given is corrupt or misunderstood by Strabo. There is either a measurement missing to determine the length of “turning aside slightly towards the east, and then” or, the phraseology is wrong. The “and then” signifies the 5300 and 1200 stadia measurements are not contiguous. However we do have two known points with which to compare Eratosthenes’ and geographical maps for the first and second cataracts. Here we read how Strabo dismisses the most important portion of the river Nile, a portion he has sailed from Syene to the Delta and the Aegyptian Sea, the whole of Lower Aegypt. Perhaps the information had been known for millennia, but, the fact Strabo continually describes it wrongly (as follows), leads one to suspect he has totally misunderstood the text of Eratosthenes. Therefore we must ask, “Would Eratosthenes have dismissed this section without a full description? Strabo later describes the river Nile in 17.1.3 as follows; “But it alone passes through Aegypt, through the whole of it and in a straight line, beginning from the little cataract above Syene and Elephantine” and reiterates the point again in 17.1.4 as is discussed later. However the next sentence in the text is made without introduction to a major place change within the information, and is perplexing in its context within the prose. We depart from the Aegyptian Sea and suddenly discuss a place 13.5 degrees latitude south comprising two rivers and an island, which is not an island, merely a tract of land encompassed by rivers, (A situation which exists to this very day.) But why has Strabo suddenly returned to the south? Are we in fact reading misplaced text and should this be the general text commencing the journey of the river Nile in the south? Thus, when these sentences discuss the rivers south of Meroë, and allow us to pin point actual places and measure the distances, we can consider the methodology of Eratosthenes and the translation of the distances quoted. Also indicated, is how a geographer such as Eratosthenes would have worked, setting out his details from point to point, rather than nebulous bends. This statement would have been far more appropriate following the distance stated from Syene to the Aegyptian Sea, as we are now 13.5 degrees north again. Book 17, chapter 1, paragraph 3, commences with a general description of the upper Nile: “But it is necessary———-because of the same lack of water”. The next section then commences with the misnomer that the river Nile is straight. The river Nile from Syene/Aswan may be described as many things but not a straight line. This may have been a general comment by Eratosthenes when comparing it to the Aethiopian Nile which is as a snake, sinuous. However, now is the point to re-iterate that in 2.5.12, Strabo clearly stated he had sailed this part of the Nile and we must therefore ask, ‘where are his powers of observation’? 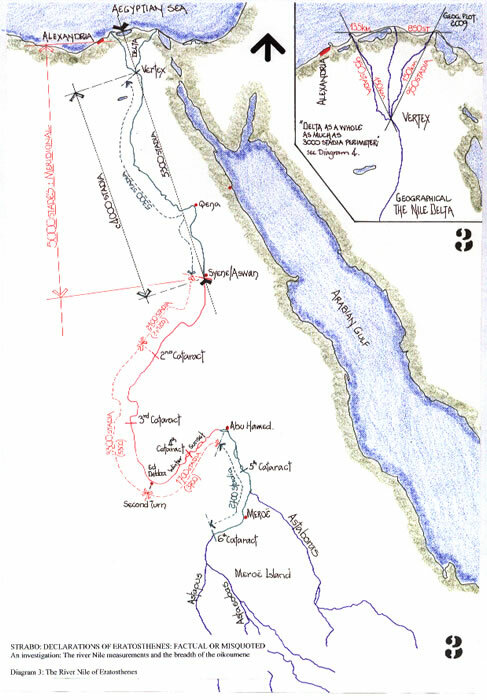 He has sailed upstream from Alexandria to Syene and is unaware of the rather large ‘S’ bend that occurs from Naj Hammadi to Qena and thence at Luxor and Armant. From the vertex of the river Nile to Naj Hammadi the course is south, then slightly east of south; after this we have the double bend and a slightly east of south journey to Syene (Aswan). From Aswan/Syene to the vertex we can draw a straight line, which possibly represents part of the rivers course, but, the deviation north of Qena is c100Km or 650 stadia of 157.5m to the west. 17.1.4: “The Nile flows from the Aethiopian boundaries towards the north in a straight line to the district called “Delta”, and then, being “split at the head”, as PLATO says, the Nile makes this place as it were the vertex of a triangle, the sides of the triangle being formed by the streams that split in either direction and extend to the sea- the one on the right to the sea at Pelusium and the other on the left to the sea at Canobus and the neighbouring Heracleium, as it is called- and the base by the coastline between Pelusium and the Heracleium. An island, therefore, has been formed by the sea and the two streams of the river—–. Now the island as a whole is as much as three thousand stadia in perimeter;—–. The parts above the Delta are also watered in the same way, except that the river flows in a straight course about four thousand stadia through only one channel—–. Strabo has stated categorically several times that the river Nile from Syene to the Aegyptian Sea is a straight line (5300 stadia) with approximately four thousand stadia from Syene to the vertex of the Delta. But, he then within his analogy of the Nile to a girdleband tells us there are greater diversions upon this supposed straight length. In other words Strabo has used the wording of Eratosthenes’ who has described his direct measure from Syene to the Aegyptian Sea, which would be a straight line, and applied it mistakenly to the actual river Nile, forgetting in the process anything he has witnessed. The text editor6 comments upon this passage regarding the girdleband as follows>>But the text seems corrupt, Strabo must have written “accordingly, it resembles lengthwise an unwound girdleband” or else “accordingly, it resembles a hand outstretched to full length, << meaning both arm and hand, and thus referring to the Delta as well as the stretch of river land from Aethiopia to the Delta itself.>> This of course can also indicate greater diversions from the shape of the arm elbow wrist and hand, which is the Delta. The text analysed above encompasses the main data for the river Nile, its dimensions and distances and is copied from Book 17, chapters 1-4. The chapters 5-10 of Book 17 contain data which Strabo most desired to portray, the history of the peoples and their interactions with the land. Therefore, we may begin to evaluate the geographical information Strabo attributes to Eratosthenes, endeavour to eliminate both original and copyist error and redress the misunderstandings which are so apparent in his text, as it has survived over the millennia. But, perhaps the most important function of our research is to finally determine the stadion length which Eratosthenes used in his geographical explanations, and thus calculate the world measure he proposed. By studying the Eratosthenes/Strabo measures and applying them to a geographical map of the river Nile we can assess the likely unit length of the stadion. This may simply be resolved by the text measure given in 17.1.2 as the distance from the Astaboras River to Meroë City, 700 stadia. Meroë City is some 45 kilometres north east of Shendi, a city of Sudan on the river Nile. The Astaboras River is now known as the Atbara River and joins the Nile near the city of Atbara. The geographical distance is c110Km. Thus, 700 stadia equal to c110Km produces a stadion of 157.5 metres. This is the same stadion as calculated from the Eratosthenes’ reading of the solstitial calculation between Syene and Alexandria. Thereby, 5000 stadia equal 1/50th of the world circle, which Eratosthenes, as we are told by Cleomedes7 increased to 252,000 stadia to ensure that the 1/60th and 1/360th part was a whole and recognisable number. That number is 700 stadia per meridional degree. Strabo further confirms this point when discussing Hipparchus8. Far out of context, if we follow Strabo’s text, but necessary here, is the discussion of the 5300 stadia straight line measure from Syene to the Aegyptian Sea. This distance is quite correct when the alignment of the distance line is drawn from Syene through the Delta vertex to the sea. Thus we emulate the basic river route described by Strabo as a straight line. This basic alignment is measured at 835 Km and thus each stadion is 157.5 metres. This alignment is however some 18 degrees west of north and the basic Eratosthenes’ world circle calculation relies upon a due north or meridional bearing. From Syene to Alexandria, measured on a meridian it is c5000 stadia, with only a minor discrepancy. Calculated using simple mathematics it would be, 5300 x Cos18 = 5040 stadia. There is north and there is northerly and we must be careful not to be too literal when reading Strabo’s text. Having indicated that the base measure of the Eratosthenes’ world is most likely a stadion of 157.5 metres, we can evaluate the Strabo measures for the river Nile. 1) 2700 stadia from Meroë to the first bend. As stated we do not know a precise point for ‘Meroë’ in this context, but the “first bend towards the setting sun in winter” can be located on the river Nile opposite Abu Hamed. Thus if we measure 2700 stadia or 425.25 Km upstream we can locate the point zero. It is in fact the SIXTH CATARACT, and this is an entirely logical point from which to take measurements. Eratosthenes has obviously correctly translated the original Aegyptian measure for this section of the river Nile. 2) The two following measurements of 3700 and 5300 stadia to the Second or Great Cataract are not reconcilable at this juncture and we must therefore move to the next measure of 1200 stadia, which Strabo states is from ‘after the bend towards Syene’. The actual text words are worth repeating;’5300 stadia to the great cataract, turning aside slightly towards the east, and then 1200 stadia to the smaller cataract at Syene’. This can be reconciled in two ways: A) from the first to the second cataract it is actually 2100 stadia and thus a mis-transcription of numbers has occurred, i.e. 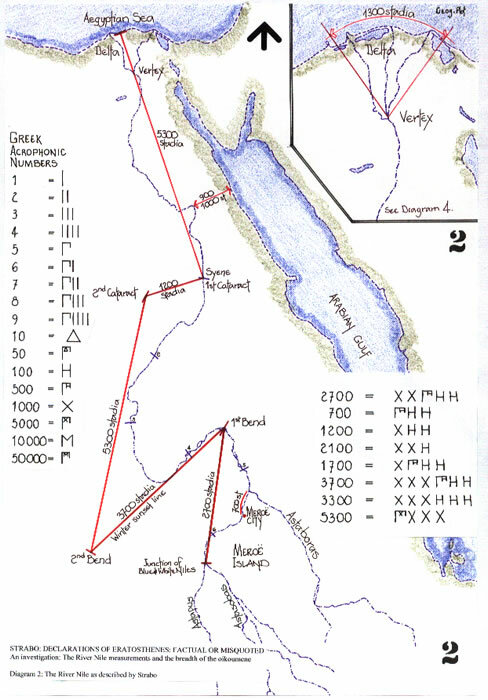 possibly reading 1200 and writing 2100; or, B) there is a feature marker south of Syene now under Lake Nasser with the “turning aside slightly to the east” accounting for some 900 stadia which Strabo has not included in his text. The matter is probably resolved by the following: from the second cataract to the second bend, i.e. upstream (see diagram 2) the actual distance is 3300 stadia. Strabo’s text notes this as 5300 stadia and may therefore be considered an error in transcription. This is not to say it is necessarily a mis-reading of the original Greek acronomic numerals, as indicated upon diagram2, but this is a distinct possibility3. However, as both distances are increased by 2000 stadia, and the following distance is the same at 5300 stadia, we can imagine the confusion. 3) From the second bend upstream to the first bend (Abu Hamed) it is actually 1700 stadia. Strabo’s text has 3700 stadia, and has already been discussed. 4) But it does allow us to assess the original data of Eratosthenes’, the 157.5 metre stadion. Each comparative measure uses a 157.5 m stadion, and it is quite apparent that if the Greek stadion of 184.88m (185m) had been used there would be no coincidence with the actual geographical measure which each of Strabo’s measures purports to be. An analysis of the Delta Region information supports this conclusion. Within Strabo’s text, 17.1.15-24 there is a complete description of the “Country from Alexandria to the vertex of the Delta”. Strabo has already quoted several times that the distance-measure from the Canobic mouth (western) to the Pelusiac mouth (eastern) is 1300 stadia, but in 17.1.6 he states it is also a sea-measure. However, Canobus is 30.05E and Pelusium 32.55E, which at 31N equates to 2.50 x 600 stadia = 1500 stadia direct measure. By sea, dependant upon the route, direct is 1750 stadia and coast hugging is 1850 stadia. There is obviously a problem with the distance measures, which may be an error of transcription from Eratosthenes’ original text, or, one of mis-translation of Aegyptian measures. It also indicates that at some period in the early first century BCE, there may have been a change to the more normal Greek Stadion of 185 metres. In 17.1.24, Strabo quotes Artimedorus regarding the “voyage up the river (Alexandria to vertex) as 28 schoeni3, that is, 840 stadia reckoning the schoenus as 30 stadia”. The actual distance along the Canobic stream of the Nile is c190Km or c1200 stadia of 157.5 metres. If the stadion were 185 metres then the distance is c1025 stadia. Even the direct route of c175Km equates to 1110 stadia, (or 945). Referring to Aubrey Diller’s paper9, the Schoenus is 12 000 cubits of 0.525 metres, or, 6300 metres, and thus equal to 40 stadia of 157.5 metres. We must therefore equate the distance of 28 schoeni with the geographical measure of c1200 stadia of 157.5m or, c1025 stadia of 185m. The calculation gives either, 42.86 or 36.61 stadia per schoeni, or perhaps the 28 schoeni equals 1110 stadia of 157.5m. But, it would seem the direct route is meant to be 40 stadia per schoeni. The Pelusium branch is in fact similar in length to the Canobic branch at c175Km or c1110 stadia/945 stadia. Therefore, the Delta is a triangle nearer 4000 stadia in girth than the 3000 stadia quoted by Strabo. But, from Memphis to Thebes is c600Km by river, and that is c3800 stadia of 157.5m. If that is divided by 120, we have 31.667 schoeni, or perhaps by a simple transposition of figures we have 120 schoeni of 30 stadia, i.e. 3600 stadia. Thebes to Syene is c220Km or 1400 stadia of 157.5m. But it is also c1200 stadia of 185m. Thus 1200 divided by 60 equals 20 schoeni, and a plausible figure. But it could be 40 schoeni of 30 stadia, and perhaps another example of to many similar units. Thus, perhaps we see not only the 157.5 metre stadion but also the beginnings in usage of the 185 metre stadion, and utter confusion. Strabo Book1, chapter 4-2. ‘Next, in determining the breadth of the inhabited world, Eratosthenes says that, beginning at Meroe and measuring on the meridian that runs through Meroe7, it is ten thousand stadia to Alexandria; and thence to the Hellespont about eight thousand one hundred; then to the Borysthenes five thousand; then to the parallel circle that runs through Thule (which Pytheas says is a six days’ sail north of Britain, and is near the frozen sea) about eleven thousand five hundred more. Accordingly, if we add three thousand four hundred stadia more to the south of Meroe, in order to embrace the Island of the Egyptians, the Cinnamon-producing country, and Taprobane, we shall have thirty eight thousand stadia’. 1) Meroë to Alexandria, 10,000 stadia due north measure. It is in fact due north c1550 Km or 9850 stadia. In fact the direct distance is 10,000 stadia. 2) Alexandria to the Hellespont, 8100 stadia given is in fact a due north measure of 6500 stadia, but curiously the sailing route would give 8500 stadia. 3) Hellespont to Borysthenes, 5000 stadia, is commensurately 4400 stadia, or 6.25 degrees of 111Km, but again with a sailing measure of 6300 stadia. 4) Borysthenes to Thule, 11500 stadia. As Thule (Iceland) was always thought to be at 63 degrees north, rather than the correct 65 degrees north, we have two figures to consider; at 65N it is 13200 stadia but at 63N it is 11800 stadia of 157.5 metres. Logically we may assume that in Aegypt, the actual land was measured and from Alexandria to the Hellespont etc, they are sailing distances, converted or not, to distances on a meridian. This was no doubt aided by Latitudinal readings. Before making any conclusive statements upon the foregoing it is necessary to consider the following text by Strabo. Strabo Book 2, chapter 5-34. Firstly Strabo discusses what Hipparchus8 (c150BC) says, starting with, “ But it will be sufficient for me to set forth the significant and simplest differences noted by Hipparchus, taking as a hypothesis, just as he does, that the magnitude of the Earth is 252,000 stadia, the figure rendered by Eratosthenes. For the variation from this reckoning will not be large, as far as the celestial phenomena are concerned, in distances between the inhabited places, If, then we cut the greatest circle of the Earth into 360 sections, each of these sections will have 700 stadia. Strabo 2.5.35, then quotes Hipparchus as follows; “Meroë to the Cinnamon producing country equals 3000 stadia south of Meroe and then 8800 stadia distant to the Equator. This measure is of course also the ITRW or ITERU previously discussed. 2) 1 schoene = 2 parasang = 60 Greek stadia or 6.71 miles/ 10.8 Km. 4) 12,000 royal cubits = 1 schoene = 3.9148 miles or 6.3 Km. However, the 157.5 m stadion is not an ‘irrational’ unit as can be shown. Many author/researchers10 have commented adversely11 upon the 157.5 metre stadion. But it converts perfectly to 350 ordinary cubits of 450mm or 300 Royal cubits of 525mm. Thus using the Schoene of 12000 royal cubits, there are 40 stadia therein and the Schoene of 20,000 royal cubits contains 66.667 stadia. But, there is one more simple calculation to consider. From the Royal cubit of 28 digits is formed the REMEN of 20 digits by the most simple of methods. The Royal cubit is the diagonal of a square formed by the Remen of 20 digits; in other words the mathematics are 20 x root2 = 28 digits (in our terms 28.284). This is an Egyptian calculation and thus gives a ratio of 20/28. Apply this ratio to the world figure of Claudius Ptolemy12 and we have his 180,000 stadia expanded to the 252,000 stadia of Eratosthenes and Hipparchus. Thus it would appear that Eratosthenes’ based his unit on the Remen of 375mm, of which there are 420 in the stadion of 157.5m., and Ptolemy et al perhaps used the Royal Cubit of 525mm, with 350 producing a stadion of 183.75 metres. This is virtually the same as the Greek stadion of c185m. It is worth repeating that the 157.5m stadion is 350 ordinary cubits of 450mm, and the Greek stadion is fairly represented by 350 Royal cubits of 525mm. Many texts refer to the Geography of Strabo including that of Germaine Aujac, page 173, in The History of Cartography. (See note 2) But few analyse the whole text comparing the geographic world to the world of Eratosthenes’. Oxford Classical Dictionary, 3rd edition, 2003, Oxford University Press. Harley, J.B. & Woodward, D. (Eds.) (1987), The History of Cartography: Vol. 1: ‘Cartography in Prehistoric, Ancient, and Medieval Europe and the Mediterranean’. University of Chicago Press. Aujac, Germaine. in The History of Cartography, chapter 10; “Greek Cartography in the Early Roman World”, pp166/67 and pp173/75; “The Map of the inhabited world recommended by Strabo” and discusses the work of Hipparchus. Chapter 9; “The growth of an empirical cartography in Hellenistic Greece”, pp148/60, but see 153/57. Cortesao, Armando. (1969-1971). ‘History of Portuguese Cartography’, Coimbra, Junta de Investigacoes do Ultramar-Lisboa, 2 vols, see1:82, where he speculates that Egyptian cadastral surveys may have been available to Eratosthenes in his calculations of the distance between the two points of observation. Rawlins, D.(2008) “Eratosthenes Lighthouse Ploy, Earth Radius 40800 Stades” DIO, International Journal of Scientific History, Vol. 14, 2008, March.pp3-12. (Web site as 7). Publication also contains “The ‘Ptolemy Geography’s’ Secrets”. This paper argues that Eratosthenes’ did not use original Aegyptian measures for his 5000 stadia measure and the world circle, but instead utilised the Pharos Lighthouse and its horizon view of the light beam for the same calculation. 3) Doursther, Horace. (1840),”Dictionnaire universel des poids et mesures anciens”, Brussels, M. Hayez, Imprimeur de L’Academie Royale, 1840. This publication contains all of the ancient Aegyptian measures, such as the Remen, Cubit (common and Royal), Iteru, and many more. The Stadion is on page 504 and the Schoinos page 481. The measures used by The Bematistai, the Bême-aploun and Bême-diploun, are on page 53. Ifrah, G. (1994-1998), ‘The Universal History of Number’”, The Harvill Press, London. Chapters 16 and 17, pp182-226. Greek and Roman Numerals. This web site explains the Greek number system, and indicates how in the acrophonic numeral system, numbers like 50, 500 and 5000 can so easily be mis-read. This was a system in use at the time of Eratosthenes and was superseded by the classical Greek alphabet where the capital and lower case letters were used. We do not know the number system used in c225BCE, but from carvings it is apparent that it was used from the 5th century BCE to the 1st century BCE. Zeidler, J. (1997), Die Länge der Unterwelt nach ägyptischer Vorstellung. Gottinger Miszellen 156, 1997, 101-112. An early division of the Duat is the Urnes, 309 iteru long. The other divisions are of equal length, and produce an overall length of 12 x 309 = 3708 iteru, to which must be added the distance for Egypt. The length of Egypt is stated as early as the Middle Kingdom as 106 iteru. Thus we have a total of 3814 iteru, or 3814 x 20000 x 0.525m = 40047Km. 5) The Egyptian ITRW or Iteru is found in inscriptions called a ‘river unit’. An early source for this unit is the White Chapel of Sensuret 1 at Karnak, dated to the middle kingdom from c1700 to c1625 BCE. It is 20000 cubits. The Greek term for this measure is Skhoinus. The New Kingdom, c1550 to c1069 BCE, has written sources referring to a smaller unit, the ‘cord measure’ (Egyptian = xt n nwH), corresponding to 100 cubits. 6) The Translator of Strabo, ‘The Geography’ has added a large number of explanatory notes for each ‘Book’. The Bill Thayer web site, Lacus Curtius (and as 1) contains extra explanations and many translations of other Greek and Roman Latin texts. This web site is comprised of Latin and Greek texts which are in the public domain and facilitates the research of geographical and cartographical subjects. 7) Cleomedes; “De Motu Circulari Corporum Caelestrum Libri Duo”; (trans. H. Ziegler). Teubner; Leipzig,Germany, 1891. An English translation of Book 1, chapter 10, appears in Cortesao, (see 2) “History of Portuguese Cartography”, 1; 141-43. Dicks, D. R. (1960), ‘The geographical fragments of Hipparchus’. The Athlone Press, London. Shcheglov, Dmitriy A, (2005),’ Hipparchus on the latitude of Southern India’. Greek, Roman and Byzantine Studies; 45 (2005) pp 359-380. 10) Fischer, I. (1975) “Another look at Eratosthenes’ and Posidonius’ determination of the Earth’s circumference”, in Q. JL. R. Astr. Soc. 16 (1975), pp 152-167. This paper discusses not only the Strabo data, the Hipparchus data and Ptolemy’s input, but endeavours to discuss the situation prior to the Eratosthenes’ world view. This paper, as we have come to expect from its author is full of equations, and accepts of no other stade than the 185 metre unit. 12) Stevenson, E L. (1932/1991), Claudius Ptolemy,’ Geography’. New York Public Library and Dover Publications Inc. New York. See also, Diller, A. (1934), Review of above book, ISIS, vol. 22, pp533-539. Also in Harley, J. B. and Woodward, D. (1987), The History of Cartography” vol. 1. “The cartography in pre-historic, ancient and medieval Europe and the Mediterranean”University of Chicago. Chapters 11 to 16 inclusive. B) Ifrah, G. (1994-1998), ‘The Universal History of Number’”, The Harvill Press, London. Chapters 16 and 17, pp182-226. C) Aujac, Germaine. (1975), ‘La geographie dans le monde antique’. Paris: Presses Universitaires. D) Aujac, Germaine. (1966), ‘Strabon et la science de son temps’. Paris. Belles Lettres. F) Dilke O A W. (1978) “Mapping of the North African Coast in Classical Antiquity”, in Proceedings of the second International Congress of Studies on Cultures of the western Mediterranean, 154-60. Paris, Association Internationale d’Etude des civilisations Mediterraneennes. 1978. G) Dilke O A W.(1985) “Greek and Roman Maps”. London, Thames and Hudson. H) Hawkes, C F C.(1977), ‘Pytheas; Europe and the Greek Explorer’. Eighth, J.L. Myers Memorial lecture: Oxford; Blackwell, 1977. I) Dutka J, (1993), “Eratosthenes measurement of the Earth reconsidered”, in Arch Hist. Exact Sci. 46 (1); 55-66. Bagnall, R.S., Manning, J.G., Sidebotham, S., and Zitterkopf, R.E. (1996), ‘A Ptolemaic inscription from Bir ‘Iayyan’, Chronique d’Égypte, 71 (142): 317-30. Baladié, R. (1980), Le Péloponnèse de Strabon: etude de géographie historique (Collection d’études anciennes). Paris: Belles letters. Burstein, S.M. (1993), ‘The Hellenistic fringe: the case of Meroë’, in P. green (ed), Hellenistic History and Culture (Hellenistic Culture and Society, 9: Berkeley- Los Angeles-London: University of California Press), 38-54 ( response by Holt, 54-64: discussion, 64-6). Clarke, K. (1999), Between Geography and History: Hellenistic Constructions of the Roman World. Oxford: O U P.
Desanges, J. (19780, Recherches sur l’activité des Méditerranéens aux confines de l’Afrique (Collection de l’Ecole Française de Rome, 38). Rome. Edwards, D.N. (2004), The Nubian Past: an Archaeology of the Sudan. London-New York: Routledge. Lipinski, E. (2003), Itineraria Phoenicia, (Studia Phooenicia, 18: Orientalia Lovaniensia Analecta, 127). Leuven: Peeters. Millet, N.B. 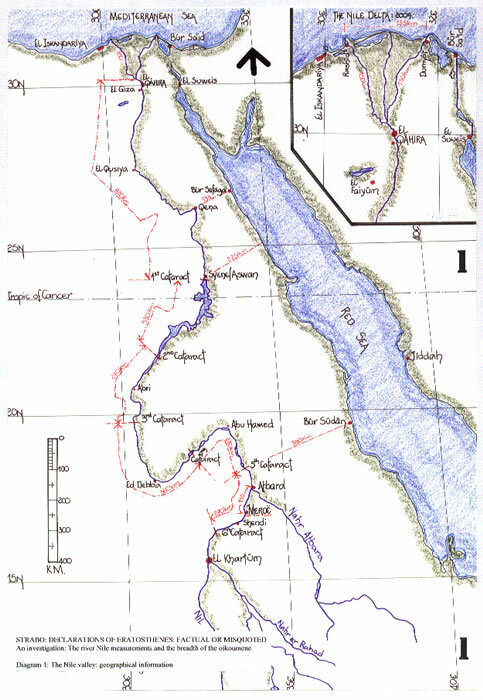 (2000), ‘Map 82 Meroë’, in R.J.A.Talbert (ed. ), Map-by-Map Directory: To accompany Barrington Atlas of the Greek and Roman World, ii (Princeton-Oxford: Princeton University Press), 1188-91. 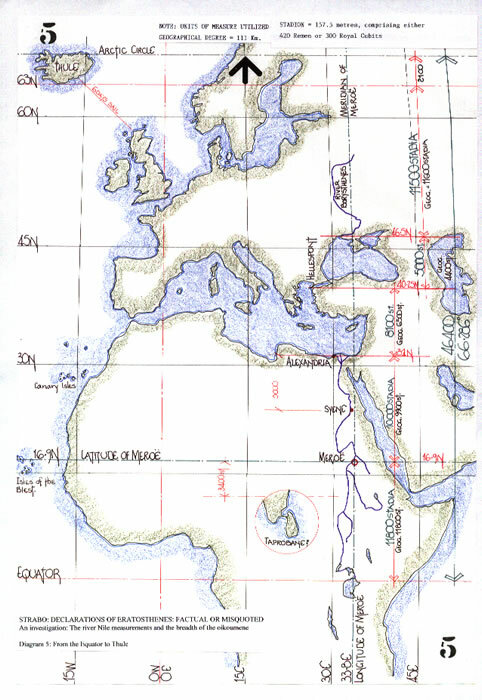 Roller, D.W. (2006), Through the Pillars of Herakles: Greco-Roman Exploration of the Atlantic. Londo-New York: Routledge. Romm, J.S. (1992), The Edges of the Earth in Ancient Thought: Geography, Exploration, and Fiction. Princeton: Princeton University Press.